You can increase the heel height on your favorite pair of boots, loafers or pumps without resoling or replacing the heel. All you need to do is add a “booster” pad between the body of the shoe and the heel. Keep in mind that it can be difficult to make the color of this pad match the color of your shoe--try it first with solid color heels in an easy-to-match color such as black or brown. Use a razor blade or knife to pry up the part of the insole that covers the heel. If you can’t pry it up, you can slit it along the edges. Peel back the insole until you can see where the heel is attached to the body of the shoe (most heels are secured with nails and shoe glue). Grip the nails with tweezers and pull them out. Note the position of the nail holes--you will put new nails into these holes later. Knock the heel gently with a hammer to dislodge it. Buy a small piece of foam core, foam matting or self-adhering shoe sole (available from shoe repair stores). 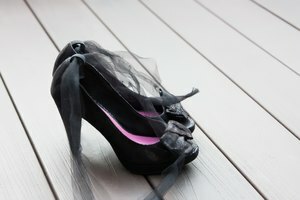 Use the top of your dislodged heel as a stencil and trace its outline in chalk along the foam core. Cut the material to the shape you traced. Hold it in place between the heel and the body of the shoe to check the size; trim if needed. Paint the insert the color of the heel. All-weather outdoor spray paint works well, as does exterior acrylic paint applied with a foam brush. If you like, you can paint over the heel, too, to make sure it’s a perfect match. Let your insert dry for the amount of time specified by the paint’s usage instructions. Glue the insert to the heel with shoe glue. Allow glue to set and dry before attaching the heel to the shoe. Glue the combined insert/heel to the shoe. Coat the shaft of your replacement shoe nails with shoe glue. Slip the shoe nails back into the holes they came from, in the body of the shoe, and press them down as far as they will go. Hammer the shoe nails the rest of the way down. Glue down the insole so it lays flat and covers the heel. Exterior acrylic paint works well for this project. It’s formulated with extra resin to help repel the elements. Do not use craft glue, rubber cement or spray adhesive to attach your insert to the heel. You must use specialized shoe glue, available from shoe repair shops. 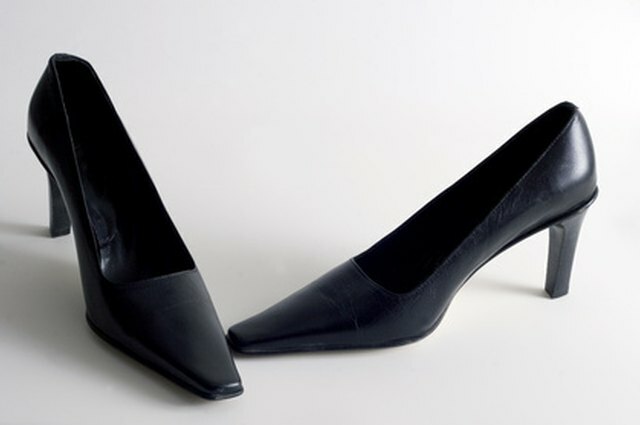 The arch of a shoe is designed to work in tandem with heel height. If you add too much height to a heel, the arch support will be placed incorrectly, leading to foot pain. Jenni Wiltz's fiction has been published in "The Portland Review," "Sacramento News & Review" and "The Copperfield Review." She has a bachelor's degree in English and history from the University of California, Davis and is working on a master's degree in English at Sacramento State. She has worked as a grant coordinator, senior editor and advertising copywriter and has been a professional writer since 2003.